For lots of children spelling is difficult. One way to help them is to look at ‘word families’ so that once they understand how to spell one word, they use this knowledge to spell similar words. For example, a child who has learnt to spell ‘cat’ can learn how this links to words such as ‘hat’, ‘mat’, ‘pat’ and so on. A nice little shortcut that boosts confidence! Our extra, free sheets this month look at word families and are perfect alongside levels 1 and 2 of the Froggy Match-it app. They deal with C-V-C words and short words ending in -ll, -ck and -ng. Get the Froggy’s Word Families sheets now. 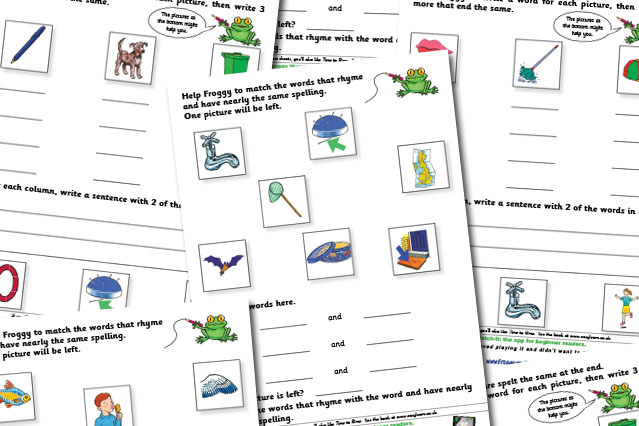 As you may know, each month we give away a set of extra worksheets that help with phonics. Parents and teachers who follow us on facebook or twitter will get the download link for each new set of worksheets as they become available each month. Alternatively, subscribe to our newsletter.